Neal became a licensed captain by age 20. Since then he has skippered over a dozen schooners and traditional craft. 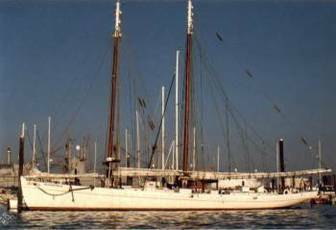 In 1986 Captain Parker purchased and restored the 67-foot schooner Wendameen. 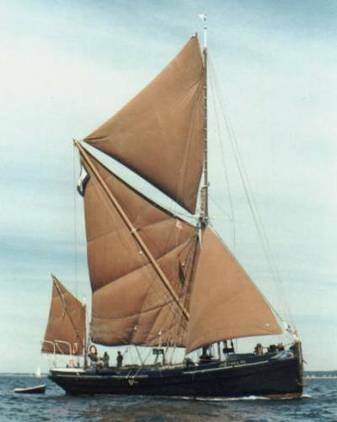 Dedicating four years to her restoration, he placed the Wendameen into the Maine Windjammer business from 1990 to 2004. After completion of the Wendameen, Captain Parker took up building and restoring ship models professionally for clients ranging from private collectors to galleries and museums. Captain Parker is also a published author whose books range from children's and young adult stories to volumes on maritime history. Owned/restored the 38' Chesapeake Bay Skipjack Little Mamie. I started with a bare leaky hull. She turned out to be the most unstable craft I ever sailed. I sold her and she is fast deteriorating near a barn not far from the field where I first found her going to pieces. 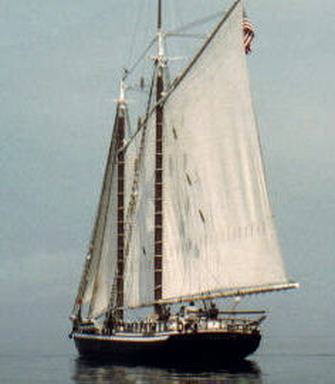 Captain of the 42' Friendship Sloop Irene, (built 1902) chartering on Penobscot Bay. One of the largest Friendships ever built. Her mains'l was so large we only took the reef out once... and that was a mistake because it wasn't long before the wind picked up. Things got pretty hairy for a while! Another great boat which fell into the wrong hands. Eventually the Irene was in such disrepair that sadly it was her fate to be dismantled. 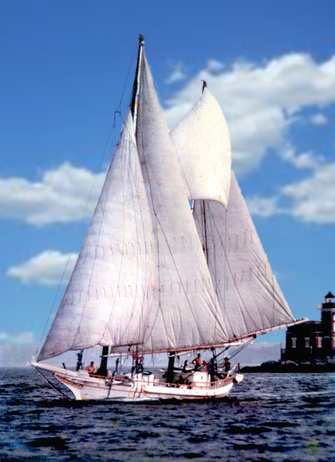 Captain of the 78' schooner Sylvina W. Beal, (built 1911) chartering from Portland, Maine. 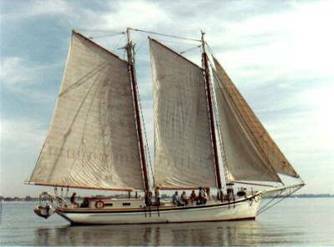 A great old schooner. Subsequent owners did not give her the care she needed. As far as I know she is no longer sailing. Owner/Captain of the 84' Thames River Sailing Barge Ethel, built in Harwich England in 1894. This magnificent vessel was haunted by the most malevolent spirit I ever sailed with. Within a few years of my selling her she got her wish and died, but not before trying to destroy her subsequent owner as she had done to me. I am told some of her remains may still be in the mud on the Thames River, Connecticut. 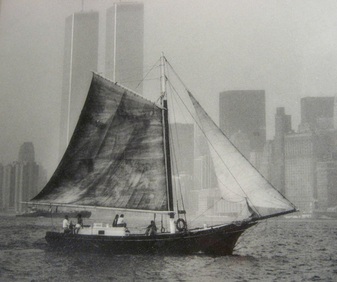 Owner/Captain of the 42' sloop Francy engaged in charters and sail training in New York Harbor. 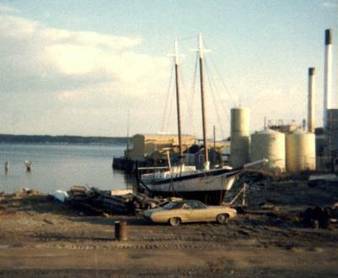 Built in 1946 in Deltaville Virginia, the Francy was one of the last sailing clam boats to work out of Sandy Hook, New Jersey. During the 1950's she was used to pirate copper wire from barges in New York Harbor. The wire, which had come from demolished buildings was burned in anchored barges to remove the insulation. I have many fond memories of this, the first big boat I was to own. Sold to an inexperienced captain, the Francy was trucked to a lake in Ohio for charter service. I lost track of her for years but came to learn she went to the bottom while on charter with flags flying. Captain of the 45' schooner Mistress on charters from Camden, Maine. Built as a motorboat before being turned into a schooner, she sailed wonderfully... if it blew a gale and and you only went down wind. But it didn't matter. She was still a lot of fun. 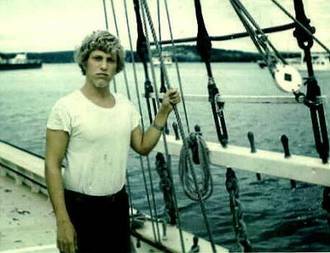 That's a much younger me at the helm. The Mistress still sails from Camden. 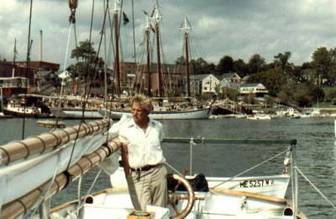 Captain/manager of the 60' schooner Richard Robbins Sr. Originally built 1902 as a Delaware Bay oyster dredger she was rebuilt for Windjamming from Rockland, Maine. I was hired to bring her to Burlington, Vermont on Lake Champlain to try and make a go of the business there. The schooner leaked so badly that she kept trying to sink. We pumped all the way on the delivery from Maine to New York and up the Hudson where the locks finally brought her to the lake. Despite the leaking, when the bilges were clear she was a delight to sail. 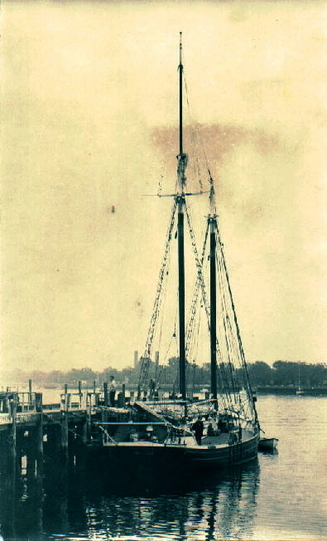 The schooner Pioneer at Sheepshead Bay, Brooklyn in 1973. Right after I took this picture I went up the mast for the first time and sat in the main cross trees pictured here. Going up was easy, but I was like a cat in a tree and it took me four hours to come down.